Owning gadgets and vehicles are important for most people, and have been for a long time. Decorating these gadgets and vehicles is a trend in this new era. People use different stickers and decals on their gadgets. These stickers are used for different purposes. Some use it to convey a message and some to decorate, make things more stylish. It has become a new fashion to share or express ones feeling through this medium, as many of these stickers have messages on them. This trend of decorating gadgets has created a huge demand for these stickers and decals on the market. Stickers and decals are used interchangeably, but what differs is their quality. Decals are of high quality and extra durable, and because of that a bit more expensive. Different stickers of various sizes and themes are available on the market. 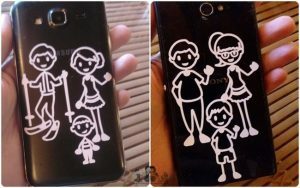 One of the themes is the family stickers, which e.g. are used on family cars, vehicles and different gadgets. Families use these stickers to convey their messages to people and stand out in the mass and show their family members personality. Applying a sticker decal on a vehicle has become a car culture these days. This recent surge and popularity of these sticker decals have provided a new market for the business. The new market has provided the customers to enjoy the personalized products. People order the stickers as per their design and messages. Before applying the sticker decal, use alcohol or soap water to clean the preferred area. After cleaning the area apply the stickers. To apply the sticker to the area, start by rubbing the lines with the squeegee or a credit card. This will help to stick the lines and details to the mounting film. After rubbing the sticker, remove the thicker paper from the mounting film. If this process does not provide the best result, then you should repeat step 2 once again. Apply the film with the sticker against the surface you have chosen. When the sticker has been applied, massage over the figures/letters to ensure they are stuck and that all air bubbles are removed. Now remove the mounting film in a sharp angle, start in one of the corners working your way across. If a part of the sticker follows the film, reapply the film and rub over the figure again. Order your personalized sticker decal today!